1. Get your chops down. A daily writing practice keeps you sharp-witted and ready to face down any adversary, including despicable villains, faint-hearted protagonists and loud-mouthed ducks. 2. Don’t take any guff. Is your internal critic jabbering up a storm? Or is some muscle-bound galoot robbing you of your beauty sleep or threatening your carrot patch? You can take them. All it takes is a good strategy and a little charisma to get everyone back in line. 3. No experience is wasted. Even if you miss the left turn at Albuquerque, have to fight a raging bull, or return a crying penguin to the South Pole, try to enjoy the ride. And take a few notes for your next story. After all, it worked for Kerouac and Hemingway. 4. Persistence pays off. You may have to play a lot of bit parts in the chorus before you get your starring role. Is writing is the love of your life? Stick with it and stay in the market for a better chance of becoming happily published. 5. Know when to improvise. Sometimes the script isn’t going the way you want. Acme Instant Holes, exploding cigars, distracting kisses, or cream pies all give you a handy exit strategy. 6. Research rules. Your hero has to stare down a lineup of burly sluggers or play a round of golf to settle a bet with an irate bagpiper, and you know nothing about either sport. Find an expert. Or learn on the fly. Just be prepared to chop up the golf course or give up a lot of homers until you get the feel for it. 7. Rise to the challenge. There are hunters, agents, critics, coyotes, Tasmanian Devils, and other saboteurs around every corner. Animated rabbit or aspiring writer, it’s not an easy life, but a most rewarding one if you choose to accept the challenge. What about you? Are you rising to your challenges? Or are you searching the Acme catalog for reinforcements? too cute. 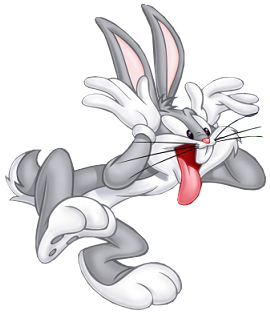 thank you for the inspiration, and the reminder of good ol’ bugs bunny. This is so cute and true! I love it! Awesome tips from an awesome bunny (and an awesome writer)! Now if only I could snag that Acme Disintegrating Pistol with which to destroy everything from writers block… to the snooze button on my alarm clock – I would be happy. Oh, I’d love one of those! I sometimes just let whatever inspiration takes hold of me and I run with it. I jot down some notes, and they may get left in my notebook until a few weeks pass. Then, I revisit them and stumble upon fresh inspiration. This never lets a great idea become stale. Trouble is, I’ve got notebooks all over the house! Sometimes I can’t remember where I put that great idea. Sometimes I stumble over an old notebook and don’t remember having written the notes inside. Then it’s completely fresh! My problem is I get the best ideas while in the shower. I’ve got to search that ACME catalog for a waterproof notebook. Another great and inspiring post! Thanks, Jen! Hey, I saw a notepad you can use in the shower. It sticks on the wall and comes with a waterproof pen. I’ll see if I can find the link. Clever and entertaining! Great advice, too.